Science has known little about Pluto since its discovery in 1930, with much of our knowledge was gathered during the late-1970s and 1980s. Until fairly recently, we knew its surface was covered with ices and that five moons orbit it. This crucially changed with the first ever encounter on 14 July 2015, by U.S. designed interplanetary probe named New Horizons, whose 10,000 km. 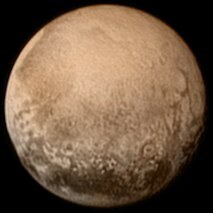 Observations had begin on 15th January at several tens of millions of kilometres, approaching Pluto by just 12,500 km. at the velocity of 13.8 km.s-1. After this, its path approached Pluto’s small 1,200 km., Charon by 27,000 km. Since then, New Horizons continues into the Kuiper Belt perhaps to encounter another target. In Greek mythology, Pluto name is Hades, who was deemed king of the Underworld. He is aptly named because of its huge distant and that the planet remains invisible except it sizeable telescopes. Pluto was one of six siblings of two Titans. He was born by the union of their father Cronos (Roman Saturn), who was the strongest and King of all the twelve Titans, and his mother, Cybele or Ops (Roman Rhea or Earth). His two brothers were Zeus (Iupiter or Jupiter) and Poseidon (Neptunus or Neptune), and his three sisters of; Hestia (Vesta), Demeter (Ceres is closely related, as it is another dwarf planet); and lastly Hera (Juno). Their grandparents were Uranus (Heaven) and Gaia (Earth). Pluto’s own parents eventually fought against their siblings in a long ten-year war known as the Titanomachy or so-called Titan War. All these siblings eventually overthrew their domineering parents, becoming instead the classical ruling Olympian Gods. Here the main spoils were then divided; Zeus (Jupiter), to rule as king over all the gods, and was responsible to dominate over the air and sky. Poseidon (Neptune) was to rule the sea, while Hades (Pluto) took possession of the myterious underworld. Pluto’s name originates to signify the ‘Wealthy One’, likely derived from the Greek word, ploutos. This is also why modern words are associated with plutocracy — meaning the government ruled by the wealthy elite. Pluto is often seen as wealthy because the living has a life debt, so everything ever born of this earth will have to repay this debt when they returned after death to cross into the underworld. In both Greek and Roman, times this was ritualised by placing a coin, or coins if wealthy, over the eyes or on the tongue of someone who had died before interment or ritualistic burial. It was believed to enact the needed payment to the ferryman, Charon, now associated Pluto’s largest moon, so that the person who died could cross the river Styx, entering the afterlife. Pluto was discovered as a faint 15th (17.0p) magnitude ‘star’ by the American astronomer Clyde Tombaugh (1905-1997) at 4pm. on 18th February 1930. This new body was first imaged in the high desert country in Flagstaff, Arizona on 23rd and 29th January 1930 using two different photographic plates taken with Lowell Observatory’s 35cm (13-inch) f/5 astrocamera. Pluto was accidentally located some 40 arcmin from the yellowish 3.5 magnitude star Wasat / δ Geminorum. With caution, mostly in fear of being in error, Tombaugh took more images then carefully rechecking the planet visually, before announcing to the world his discovery. This was finally made on 25th February 1930. Although the discovery of Pluto was really being ‘in the right place at the right time’, in truth it was found during a specific planetary search programme for any possible new Trans-Neptunian planets. On the day of the discovery, Tombaugh was using an image device called a blink-comparator, which alternatively blinks between the two different images. Simply any star that remained fixed in position was likely unrelated to the Solar System, while those changing position were probably in orbit around the Sun. Furthermore, observing the positional rate of change tells of the approximate distant of the object — whereas asteroids nearby move more rapidly that bodies nearer the edges of the known Solar System. It soon became quite evident, even not knowing the orbital parameters, that the very pedestrian movement against the background stars that this body placed it far more in distant than Neptune. Pluto takes some 247.9 years to just orbit the Sun, being just two years shorter than the often quote period of 249.9 years that once stood for decades. Average distance is some 39.5 A.U. or 5.7 billion kilometres from the Sun, moving at the slow orbital velocity of about 17.1 km.sec-1. Also because of the highly elliptical orbit may be as close as 29.7 A.U. at perihelion (05th September 1989 AD in Libra), or as far away as 49.3 A.U. at the next aphelion on 21st August 2113 AD when Pluto will be in Cetus. Mean Distance (a) : 5.9064 ×1012 km. Min. Distance : 4.444 ×1012 km. / 29.7 A.U. Max. Distance : 7.384 ×1012 km. / 49.3 A.U. During aphelion, Pluto drops by about 2 to 2½ magnitudes and is about two-thirds the size compared to when it is closest to the Sun. Observers today have been very lucky to live during the time when Pluto is easiest and brightest to observe For about fifty years around 2113 AD, this small dwarf planet will require at least an aperture of 40cm. in dark skies to even see. For many years there was much uncertainty on the true diameter, as Pluto appeared stellar-like even in the largest of telescopes. Presently Pluto is estimated by the Jet Propulsion Laboratory (JPL) to be some 2,302 kilometres across (2006), which very slightly larger than the often earlier quoted 2,274 km. Some other texts sometimes quote the slightly rougher estimate of 2,500 km. Unlike most of the planets, Pluto is highly inclined to the ecliptic, who tilt is 17.1°. Temperatures in this region of space are very cold without any real warmth from the Sun, so we find the surface temperature is chilly at −233° to −223°C or just 40K to 50K above absolute zero. Since first discovered, very little was known about Pluto. Now after the dedicated New Horizonsinterplanetary mission in 2015, far more information is known today. Launched on 19th January 2006, the craft arrived on 14th July 2015. We may have sometime to wait until better images are obtained or new secrets are revealed. Spectroscopy and rare planetary occultations by stars first showed a weak tenuous methane atmosphere, extending perhaps out by almost 40% the planet’s radius. At present this tiny dwarf planet lies close to perihelion (nearest the Sun), so temperatures can reach some −220°C. Yet when the planet is placed at aphelion, this methane is likely freeze solid. So perhaps this atmosphere is only exits temporarily. This discovery was made late in 1988 by careful photoelectric observations during the time when the planet was occultated by a brightish star. As for any surface features, the best so far has been obtained by the Hubble Space Telescope (HST). These were made between late June to early July 1994 and imaged nearly the entire surface using the European Space Agency’s (ESA) Faint Object Camera (FOC). (See one of these in the pixelated images of Pluto above.) Although the resolution is poor, down to about 200 kilometres, there is clear evidence of one dozen or so patches of brighter regions are intermixed with the slightly darker surface. When at opposition, Pluto looks like just another faint 14th magnitude star without any discernible disk, and so something like 25cm (10-inch) telescopes are needed to observe it. However, some keen-eyed amateurs have claimed to have glimpsed the plant 20cm. Although the telescopic view of Pluto is frankly disappointing, all amateurs that see this dwarf planet once or twice in their observing career should considered themselves as reaching some desired personal goal. Pluto presently subtends somewhere between 0.13 and 0.14 arcsec, so for all intents and purposes remains unresolvable through amateur telescopes. Now (2009) the average ecliptic polar tilt of −34.5°. Over the next few decades, it is well positioned for southern observers. There was in the last decade or so some significant debate whether Pluto should be classified as a true planet, an asteroid, even as a comet; all mainly because of its relatively small size. In about 2001, this question was extended if Pluto should be considered a planet at all. The matter has been raised mainly because of the many hundreds of new trans-Plutonian bodies or KBO’s (Kuiper Belt Objects) that have been discovered since 1996. Pluto, in light of this, is now considered as an example of these KBO’s. During 2003 this story has been made far more complicated with the discovery of the trans-plutonian object known as Eris or KBO 2003 UB 313 , which itself is slightly larger than Pluto. For a short time, Eris was openly declared as the new 10th planet. Like Pluto, however, the accepted planetary status of these bodies may be also be changed in August 2006. Here the I.A.U. who controls the naming of all celestial bodies will decide their fate during a scheduled meeting in the Czech capital Prague. Soon we may have either eight or ten planets in the Solar System. If this same international jury rules against this possibility, then Pluto prominence as a planet may be simply stripped — leaving just eight official planets in our Solar System. In the meantime, the actual number of planets does remain in flux — making difficulties for those teaching astronomy to children or those writing astronomical books! At the time between 1840 and 1930, there was always the general suspicion of the existence of one or more main planets beyond the orbit of Neptune, that were collectively called Planet-X (and other letters of the alphabet for any additional unknown planets.) This held belief was based on the small by observable effects of perturbations by all the planetary gravitational bodies in the Solar System. These small accumulating anomalies can cause major problems in predicting planetary positions, as in the case of Pluto, by the small gravitational pulls of Uranus and Neptune. As previously discussed regarding the discovery of Neptune, understanding these small perturbations were pivotal evidence. In Neptune’s case, this was found by complex mathematical calculations of all the known observations of Uranus. At the time of the discovery of Neptune this prediction was heralded as the greatest achievement of science in the mid-19th Century. Astronomers after the 1840s, considered the possibility of other planets beyond Neptune, but all dedicated observational programmes failed without much success ’ until Pluto discovery in 1930. Although Eris was once popularly nicknamed Xena, after the main character in the television series Xena : Warrior Princess. However, the name was certainly known to be tentative. If was to be named a true planet, it will almost certainly retain a true classic Greek mythological name, which I once guessed should be known as Persephone. This is quite suitable, as she is in Greek mythology the goddess of the Underworld, being the daughter of Zeus and Demeter. In Roman mythology she is known as Proserpine. Her name is also quite apt for astronomers, as the derivation implies the “one who destroys all light.” Sadly, I was proved to wrong when the official name was announced.